Mudan Grotto is a Dwemer ruin hidden underwater southwest of Ebonheart. 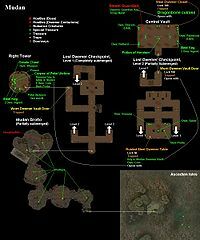 It consists of four areas: the Grotto, the Lost Dwemer Checkpoint, the Right Tower, and the Central Vault. The enemies here are a slaughterfish and three other leveled water creatures. You can find nine kollops here, two of which are unreachable. The only thing of interest here is the entrance to the Lost Dwemer Checkpoint. This area is a crossway between all other areas of the ruin, since they can all be accessed from here. It consists of two levels: a lower one which is submerged and an upper one which is only partially submerged. 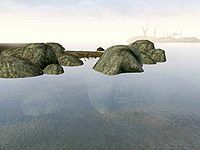 The enemies here consist of five leveled water creatures in the lower level and two Dwemer centurions in the upper level or one Centurion and one Steam Centurion. There is not much of note in the lower level. In the upper level the loot consists of a potion, an apprentice lockpick, a journeyman armorer's hammer, a rare bent probe, Dwemer greaves, and a spear. There is a rusted table that is locked and trapped, but it can be opened with a key found in the Right Tower. The table contains a key that opens the door of the Central Vault and a single Dwemer coin. This is the only area in this ruin that doesn't have any enemies. The loot consists of several steel kegs (most of them empty) containing valuable ingredients and an ornate chest containing a random Dwemer weapon. Here you can also find the skeletal corpse of Peke Utchoo. It has a key to the table in the Lost Dwemer Checkpoint, six Dwemer coins, and another bent probe. Near the corpse is a note with Peke Utchoo's last words and a sample of the poison that killed him. The door is trapped and locked and can be opened with the key found in the rusted table in the Lost Dwemer Checkpoint. There is a Steam Guardian, a unique and improved version of the Steam Centurion, who possesses a key to the closet containing the legendary Dragonbone cuirass. The other loot is a few pieces of Dwemer Armor (both left and right pauldrons and bracers) and a Dwarven Halberd, a master's armorer's hammer, a greater Soul Gem, another keg containing valuable ingredients, and some Dwemer coins and Dwemer clutter all lying around. There is also a unique Potion of Heroism found on top of a bookshelf.